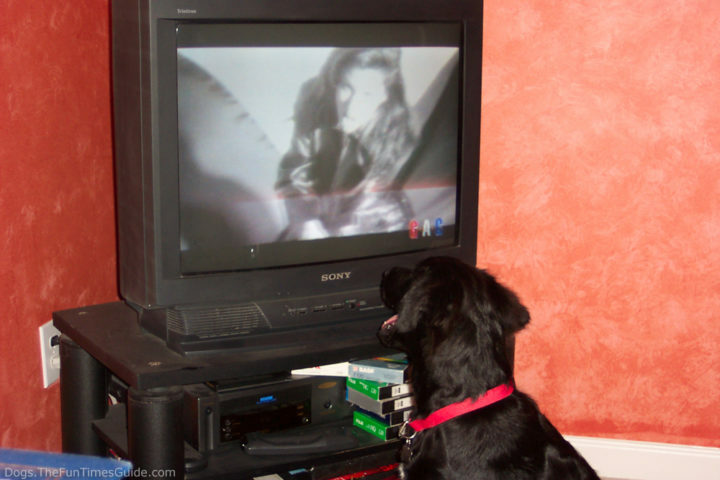 Most dog owners will tell you that their dog watches television with them. In fact, according to the American Kennel Club, 87% of pet owners say that their pets watch TV. To an extent, they are correct. However, a dog eyesight is very different than human eyesight, so what your dog is actually “seeing” is quite different from what you’re seeing on the TV screen. A dog’s eyesight allows them to see better at night than we do. Dogs also see flickering light better than humans do. That means when watching television where we see one solid screen, dogs see each individual frame. Dogs cannot see the actual objects on the TV screen. They simply see the movement and the shapes on the television instead. Dogs don’t have the same depth perception that humans have, which also explains how little they can actually see on a TV screen. While dogs don’t just see in black and white (as many people think), they are not able to see as many colors as we can. It’s though that they see the world similar to a red-green colorblind person. 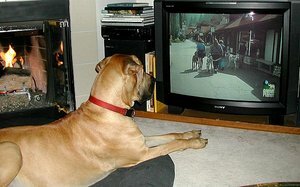 Dogs can also differentiate the sounds coming from a TV versus those heard in the real world. The sounds coming from the TV seem to be just as entertaining for them as it is for us to watch them responding to the sounds! I still think when I’m watching drag racing my dog is watching right along with me. Maybe it’s the sound that is drawling her to watch television. It’s a sound that she knows from going to the races. When she is watching the races on television, she moves her head as she watches the cars go down the track.